This article was written by Katherine Woods and was first published in July 2013. I’ve been facilitating meetings for nearly 20 years. It makes me feel old just saying that! During that time, many things have changed. In the early days, the Internet was still in its infancy. I remember sending emails on a painfully slow dial-up connection, and mobile phones were still HUGE. Much has also changed in the business world, yet how people think about business meetings has changed very little. Oblivious – They accept unproductive meetings as part of doing business. They might moan about them but they don’t know that there’s an alternative and don’t realise that poor meetings are a cost to their business. Cost-conscious – These people recognise the cost of unproductive meetings and focus on mitigating costs. 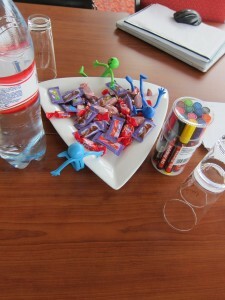 They usually concentrate on the quality of the meeting content and on minimising its running costs. Value-driven – This group appreciates the huge value that can be unlocked when people are engaged in highly productive meetings. The vast majority of business managers are still in camps 1 or 2. We are fortunate to work with many clients who are move value-driven but these tend to be rare in the business population as a whole. In most offsite meetings, great attention is paid to the content. Interestingly, its quality tends to be judged by how ‘leading edge’ it is, rather than by how clear and easy to digest and useful it is. A great deal of emphasis is put on the logistics and the costs of running offsite events. These areas seem to be total blind spots for most business managers, yet this is where the value lies. A focus on content and logistics sits alongside a belief that meetings are all about people understanding issues. The erroneous assumption is that if they understand, they will do something – but this is rarely the case. I am sure we’ve all experienced the ‘knowing, doing’ gap. It’s the difference between understanding what we need to do and actually doing it (just like the person who knows excactly how to get fit, but never exercises!). Someone once told me that no one can motivate another person: we can only provide an environment in which people can motivate themselves. I think that this is a very wise statement. So, I’m not saying that facilitators have some snake oil injection that we can give to our meeting participants to motivate them into taking action. However, what we do know is that a meeting environment needs to have a clear purpose and outcomes, with processes that engage people with those outcomes and engender a high level of trust and respect (the sign of energy). This will mean that the participants are much more likely to motivate themselves than by having an environment that is only about understanding the issues. Ironically, with the right kind of preparation of facilitation, this kind of meeting environment can be created anywhere – even in a barn! Some of the whizz-bang special effects paid for in meetings just aren’t necessary if you want to engage people’s hearts and minds so that they take aligned action. The discerning meeting holder can decide where to spend their budget: on a fancy hotel meeting room and meeting entertainment, or on the work that gets done in the meeting. I wonder what the next decade will hold in terms of the focus on the business meetings? If I had a wish, it would be that business managers and leaders will become more value-driven in their thinking about meetings. If you would like to learn more about Attention and Energy in meetings give us a call at +44 (0)20 1628 471 114 or send us our contact form. We’ll get back to you as quickly as we can.